Hello lovlies! I hope that you all had a great week and will have an even better weekend! How's that for some Friday optimism? Haha! The glitter of this mani, guys. THE SHINE! It's one of those manis that is literally blinding if you're in direct sunlight. In this picture, my middle finger looks about one tenth of the glitter strength in real life. Honestly, there's probably a chance that I'd blind an astronaut, if the angle was right. Haha! And here's a little hint if you ever want to wear three coats of hex glitter: Make sure that you have a bamboo stick for taking it off! Otherwise, you'll be scrubbing with a soaked nail polish pad foreeeeeeeever. Looking forward to seeing what pretty nails everyone is rocking this week! Well, I'm just hoping that you didn't give anyone the finger this week. They'd blinded! Seriously though, I love this mani!! 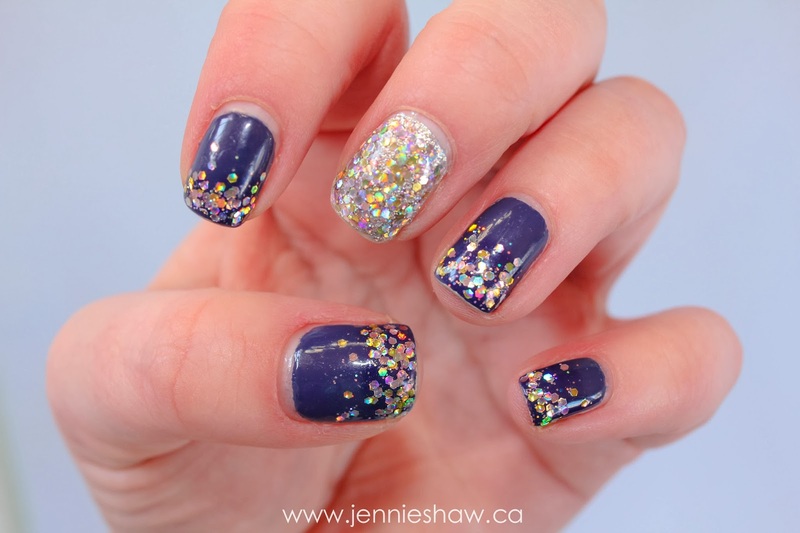 Blurple, glitter, sparkle...You've got it all girl! I missed you Nail Filers! I'm sorry I've been only a part timer lately. <3 Have a great weekend! Oh I really like that glitter and the color combo you chose. Looks great!!! BLINDING AN ASTRONAUT!! I can't even--thanks for making me spit coffee all over my computer. This manicure is gorgeous. I'm all about all the glitter all the time-I just don't do it as much as I'd like (as in-ALLTHETIME) because I hate the process of taking it off (yes, even with the aluminum foil trick). Seriously-so pretty though. And I might need to get my hands on queen b! I'm off to troll your Pinterest for inspiration....my nail brushes are here, but I am uninspired (nail ennui?) and need to get on it. 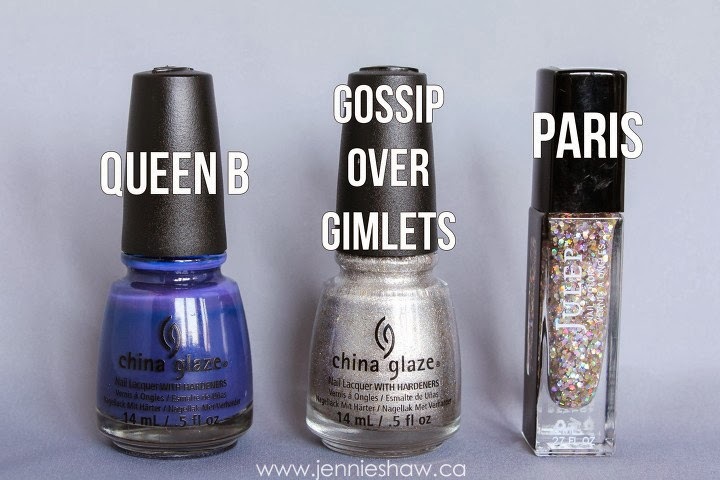 I love all three of the polishes you used for this one Jennie! Paris reminds me of a pearlescent vanilla cake for some reason. I am curious about your 'flat nail art brush' - and now I want to see it. SHOW ME! Girl that glitter...oh my! You neeeed to get some pics of that in sun light for real. haha Wow! I really like that purple. It reminds me a bit of 1 of Essie's polishes. I have it, but I can't seem to find it right now. I love this! I love purple!!!! And glitter! I just got my February Julep box and got the new Party's Over Glitter remover this month!!!! Yassss, I'm in LOVE with Paris! Great combo! Cute nails! I love the colors and the designs! Thanks for hosting the link up, and enjoy your evening.